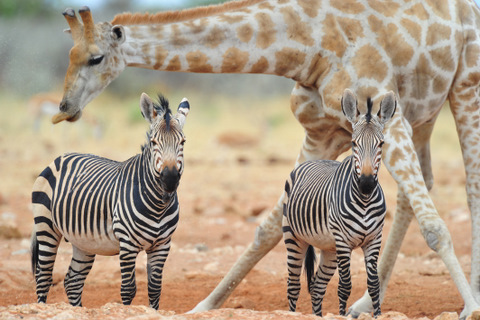 When the first explorers discovered Etosha in the 1800s they enthused about it being wild and unspoilt and this is what people are still looking for today when coming on an African safari. 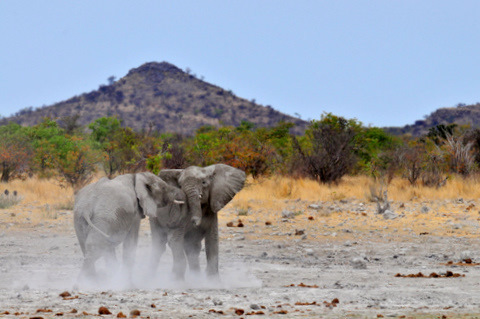 The problem is there are very few places left in Africa that can be called unspoilt wilderness areas, with a few exceptions - and the western part of Etosha is one such place. the sweet grassveld transitions to thick scrub mopani woodland until you reach Nomab waterhole where the acacia shrubveld starts. The dolomite hills will slowly rise from the horizon as you are driving and then suddenly, when you reach Duineveld waterhole, you will be surrounded by craggy dolomite hills. 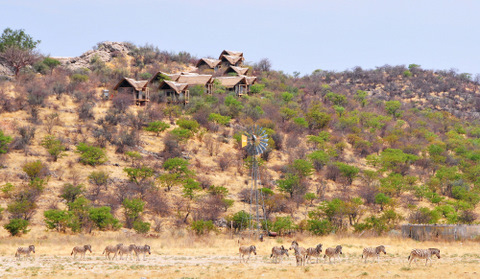 Dolomite camp is situated on one of these hills overlooking Dolomietpunt waterhole. 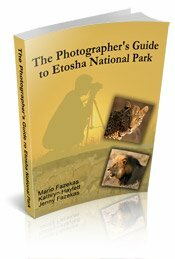 If you are a photographer, there are about 20 waterholes in this western part of Etosha of which about half are worth visiting as the others are dry or have been closed. 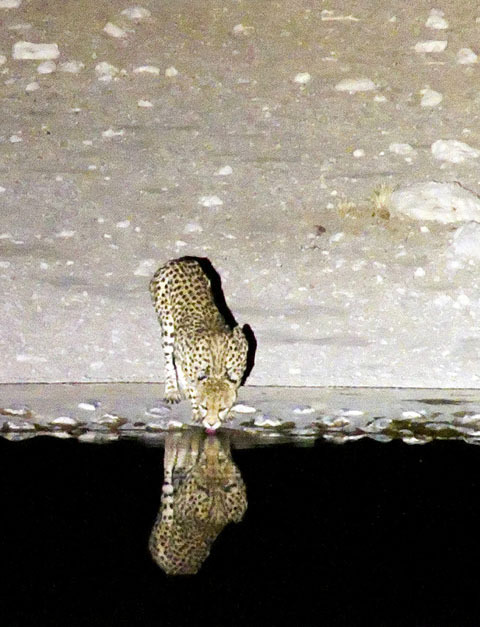 Our favorite waterholes are Klippan, Rateldraf, Dolomietpunt, Okawao, Renostervlei, Olifantsrus and Tobiroen. 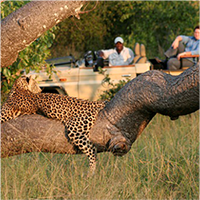 We saw a pride of lions, two cheetah, three black rhino, herds of elephant as well as baboons, zebras and giraffe either from Dolomite camp or within a few kilometers of the camp. When you arrive at Dolomite camp there is undercover parking and the golf carts fetch you and your luggage from the car and if it is raining the golf carts have plastic see-through flaps that get unrolled and zipped up so you and your luggage stay dry. There are 20 en-suite chalets built on elevated wooden decks situated on the outer edge of the dolomite ridge - 12 chalets face west and 8 chalets face east, providing opportunities to photograph magnificent sunrise and sunsets from the comfort and privacy of your chalet. 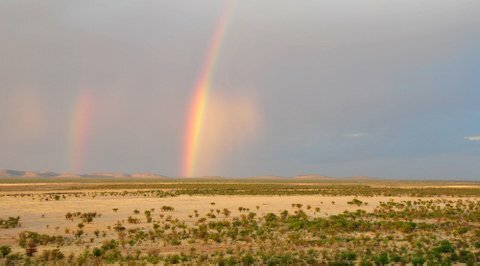 In addition to the sunrise and sunsets you will have Rolling hills, open plains, saline pans, dolomite outcrops and herds of plains animals to include in your photographs. The chalets are very smart and were furnished and finished in a most appealing style. 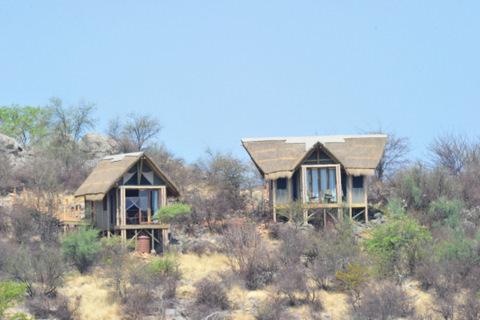 Each unit is a wooden frame with thick canvas for the walls topped with a thatched roof. 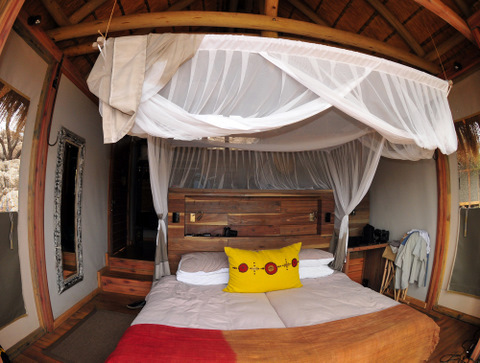 All 20 chalets have en-suite bathrooms, tea/coffee stations, but no air conditioners. We found the chalets to be cool so we did not miss the air conditioners but the 12 west-facing chalets get very hot in the afternoons. We stayed in chalets 13, 14 and 18, which are all east-facing and therefore cool for most of the day. There was no fridge in the chalet but we were told that fridges are on order but if you want a cold drink or beer, just one phone call to reception will ensure that room service delivers to your room. All the staff members are new and are enthusiastic so you tend to get excellent service. There are also two restaurants (each seating 22 people), a bar, two fireside bomas, a lounge, a curio shop at reception and a large infinity swimming pool. 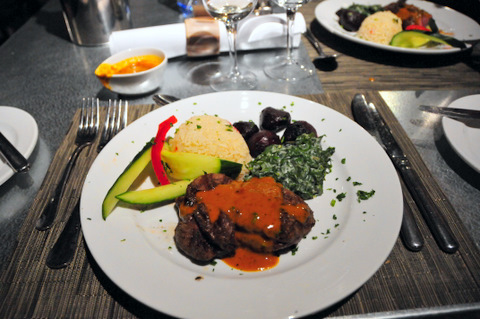 The food in the restaurants was superb - dinner was an event! 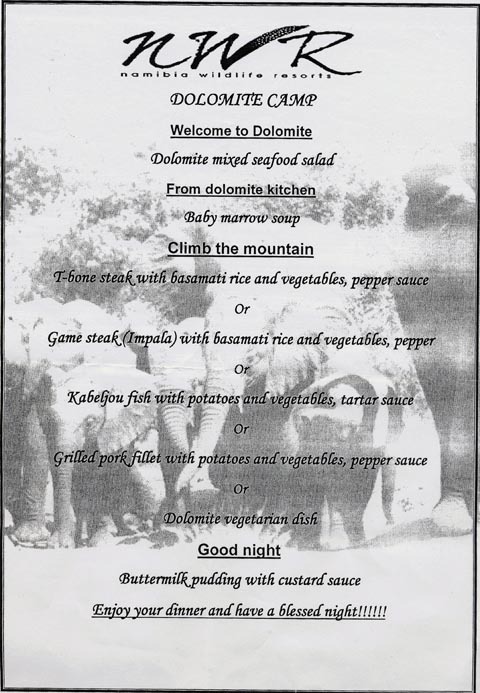 The above menu is from one of our five nights at the camp. 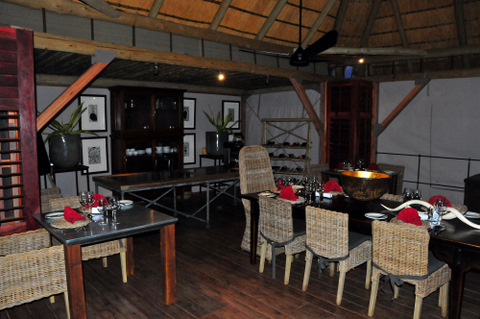 Each night the menu was different and included one game dish, like impala, kudu or eland, plus a 'normal' dish such as T-bone or rump steak. 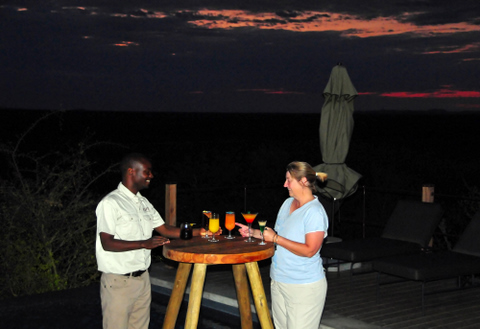 The camp is unfenced which means you can walk between the chalets and restaurant area by day but not at night. For dinner the golf carts will fetch you or camp staff members will walk you back to your chalet. 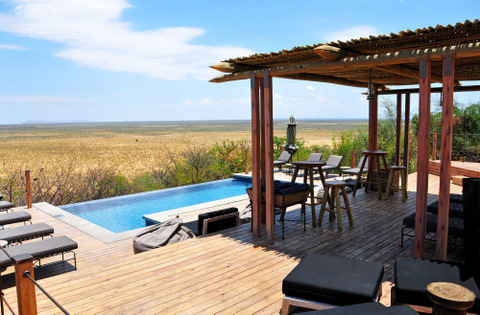 Three of the east-facing chalets are luxury chalets (numbers 13, 19 and 20) which means you get a large deck with a private plunge-pool. If you are unfit or disabled then we suggest you stay in the chalets that are closest to the restaurants, bar, and camp entrance. These are chalets 1, 2, 3 and 18, 19, and 20 on the southern end of the hill. Chalets 12, 13 and 14 are on the northern side of the hill and will entail the most walking. But keep in mind that there are golf carts that can fetch and carry you if walking is not your thing. 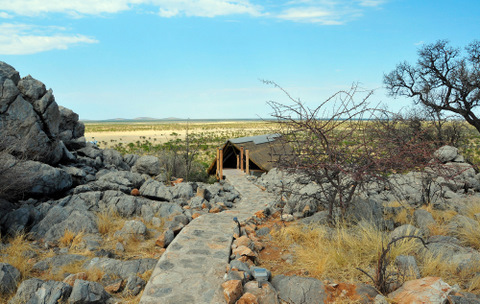 Dolomietpunt waterhole can be seen from just two chalets (13 and 14) but there is talk of a hide or viewing platform being constructed closer to the waterhole to enable all guests to view the waterhole. ... and obviously chasing the rhino away. 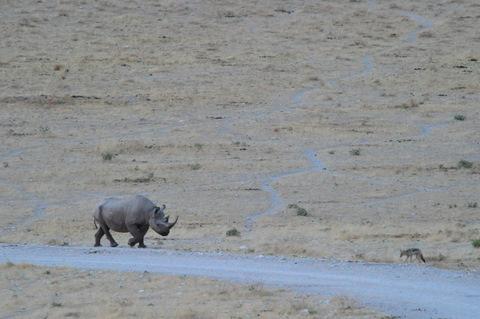 We watched the rhino running until he disappeared from sight! About 90 minutes later, when it was dark, the rhino was back at the waterhole. If you wondered why there is a no-entry sign at Dolomietpunt waterhole wonder no more! 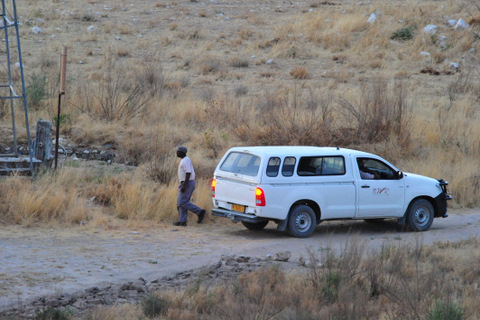 Guests are watching animals from their chalets and then vehicles that drive into the waterhole tend to scare the animals away. 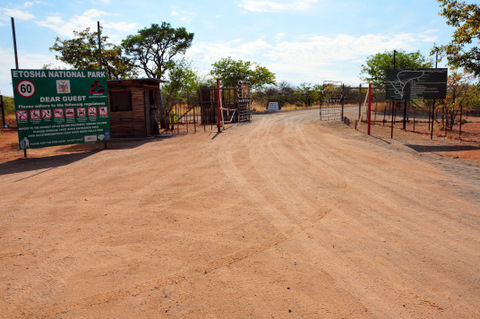 NWR - please keep Dolomietpunt a no-entry waterhole and please tell employees that if there are animals there to come back later! 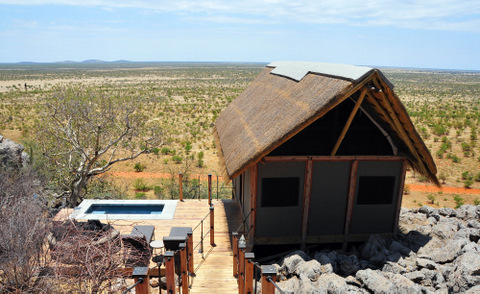 If you don't get one of the waterhole-facing chalets it's not a disaster as you can view animals coming to and from the waterhole on the plains below from all the chalets. We stayed in chalet number 18 and we had a great time - we didn't miss seeing the waterhole at all. 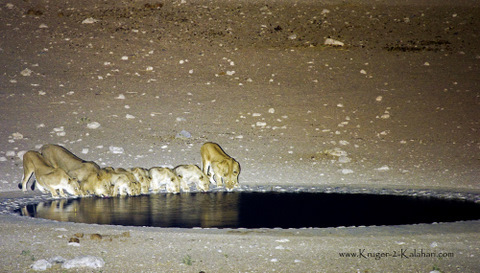 If you are a landscape, bird or macro photographer then photographing from the camp is very nice but if you are a wildlife photographer we suggest you focus on visiting the nearby waterholes as Dolomietpunt waterhole is at least 250 - 300 meters from the nearest chalet so wildlife photography can be a challenge if you do not have the right photographic gear, such as a 500 or 600mm lens. And nocturnal photography can be virtually impossible if you do not have a bright light such as a Lightforce 240 Blitz 70W HID spotlight! We found that many visitors at Dolomite camp stayed for just one night but you cannot get a feel for the camp or the western part of the park in such a short time. 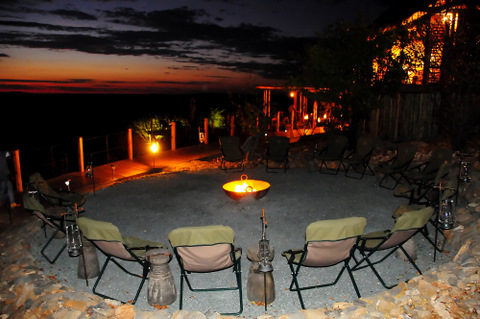 We would recommend staying for at least 2 or 3 nights, especially if you are a wildlife photographer. 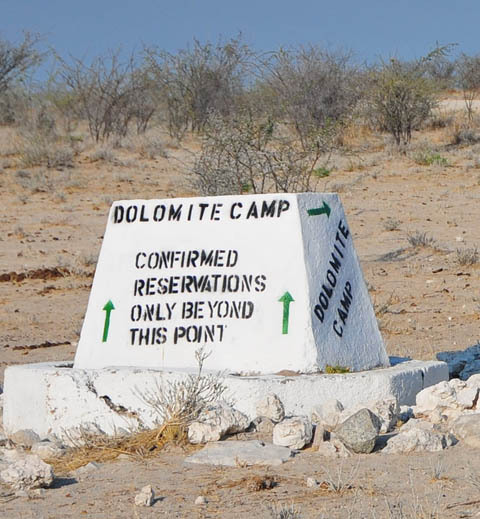 Having said that, please keep in mind that the nearest petrol station is about 70 kilometers away in Kamanjab, outside Etosha, so please make sure you fill up your vehicle before coming to Dolomite or bring a jerry can! Our Toyota Prado has dual fuel tanks so we have 170 litres of fuel that lasted us the trip from Okaukuejo plus all 5 nights at Dolomite and each day we drove around to the different waterholes. 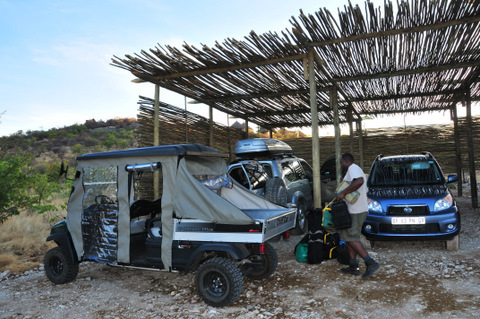 The day we left Etosha we exited at the Galton Gate and refuelled in Kamanjab. 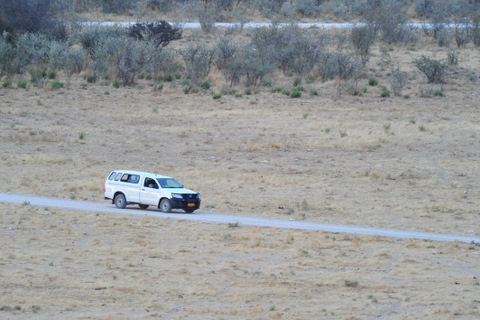 As we mentioned previously, the service from Dolomite camp management and employees is superb and they arranged for a jerry can of fuel to be brought to the camp on the next supply truck for one of the guests who did not want to travel to Kamanjab. Nothing was too much trouble for the staff members!